Suitable for senior undergradutate courses and graduate courses. Nouredine Zettili received his Ph.D. in 1986 from MIT and is currently Professor of Physics at Jacksonville State University, USA. His research interests include nuclear theory, the many-body problem, quantum mechanics and mathematical physics. He has also published two booklets designed to help students improve their study skills. 1. Origins of Quantum Physics. 1.2 Particle Aspect of Radiation. 1.3 Wave Aspect of Particles. 1.5 Indeterministic Nature of the Microphysical World. 1.6 Atomic Transitions and Spectroscopy. 2. Mathematical Tools of Quantum Mechanics. 2.2 The Hilbert Space and Wave Functions. 2.5 Representation in Discrete Bases. 2.6 Representation in Continuous Bases. 2.7 Matrix and Wave Mechanics. 3. Postulates of Quantum Mechanics. 3.2 The Basic Postulates of Quantum Mechanics. 3.3 The State of a System. 3.5 Measurement in Quantum Mechanics. 3.6 Time Evolution of the System’s State. 3.7 Symmetries and Conservation Laws. 3.8 Connecting Quantum to Classical Mechanics. 4.2 Properties of One-Dimensional Motion. 4.3 The Free Particle: Continuous States. 4.5 The Potential Barrier and Well. 4.6 The Infinite Square Well Potential. 4.7 The Finite Square Well Potential. 4.9 Numerical Solution of the Schrödinger Equation. 5.3 General Formalism of Angular Momentum. 5.4 Matrix Representation of Angular Momentum. 5.5 Geometrical Representation of Angular Momentum. 5.7 Eigen functions of Orbital Angular Momentum. 6.2 3D Problems in Cartesian Coordinates. 6.3 3D Problems in Spherical Coordinates. 7. Rotations and Addition of Angular Momenta. 7.1 Rotations in Classical Physics. 7.2 Rotations in Quantum Mechanics. 7.3 Addition of Angular Momenta. 7.4 Scalar, Vector and Tensor Operators. 8.2 Systems of Identical Particles. 8.3 The Pauli Exclusion Principle. 8.4 The Exclusion Principle and the Periodic Table. 9. Approximation Methods for Stationary States. 9.4 The Wentzel-Kramers-Brillou in Method. 10.2 The Pictures of Quantum Mechanics. 10.4 Adiabatic and Sudden Approximations. 10.5 Interaction of Atoms with Radiation. 11.1 Scattering and Cross Section. 11.2 Scattering Amplitude of Spinless Particles. 11.5 Scattering of Identical Particles. B. Angular Momentum in Spherical Coordinates. B.1 Derivation of Some General Relations. B.2 Gradient and Laplacianin Spherical Coordinates. B.3 Angular Momentum in Spherical Coordinates. C. C++ Code for Solving the Schrödinger Equation. This edition has been completely updated. A clear, balanced introduction to quantum mechanics combining essential theory with practical applications. Includes over 65 solved examples and each chapter concludes with an extensive collection of fully solved multipart problems. 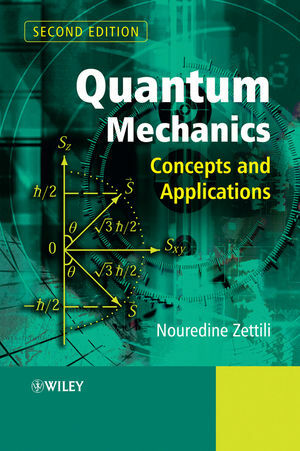 Provides an in-depth treatment of the practical mathematical tools of quantum mechanics.